The ‘Starter’ class is a class that caters for a diversity of dogs and handlers and aims to teach handlers how to develop the early skills necessary before progressing to more advanced gundog work. Typically, those attending this class include people coming for the first time as handlers with pups, handlers with youngsters that are still learning and those handlers that may have been training for a while but either they or their dogs are not yet ready for more advanced work in the next class. The Trainer therefore adapts his training exercises to the experience of the handlers and dogs he has before him on the day as there is no particular level that you need to be achieving before being able to join in. When joining one of the Starter classes with a young or inexperienced dog, it is worth noting that, at this stage, the Trainer will only be able to do some very basic work with the dog, eg. 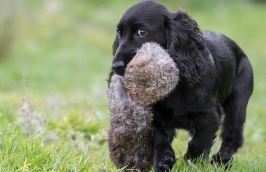 walking the dog on and off the lead or simple retrieves, as the emphasis is placed on teaching the handler. The Trainer will therefore advise you on where he thinks you are in your training and any problems he can see that are being created and also advise you on the exercises you can do at home to establish and condition the right behaviour. As to the handler: it’s about listening, taking the advice on board and watching other handlers and their dogs in the class – you will pick up a lot of information that will help you. A large element of training with a young dog is to start off the right way and think about what you are teaching your dog when going about your early training and your day to day routine. You need to be the main focus for the dog by providing the stimulation and fun in its life. 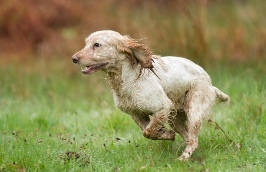 Often people think ‘ it’s only a pup’ so take this literally and let it run around pretty much doing its own thing – this, however, very quickly creates an independence in the dog and, as it grows in confidence, it comes to rely less on its handler for stimulation and fun and more on itself eg. free running and free hunting. Soon the handler becomes someone that doesn’t really figure too much except at meal times! Developing this focus is therefore a crucial part of early training and the key is to create and condition the right behaviours from the outset whilst allowing the dog, and you, to have some fun together. The Trainer aims to teach and instil this approach during the class.